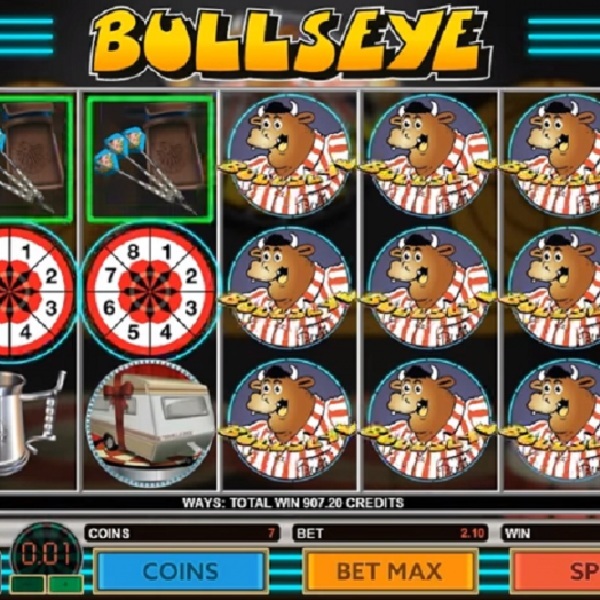 Fans of the quiz show Bullseye will be pleased to hear that Microgaming has launched a new slot game based upon it. The slot is faithful to the show and even includes voiceovers from Jim Bowen and Tony Green. It is a 5 reel, 243 ways to win game and on the reels players will find a caravan, a speedboat, a small car, cash, a set of darts, a flight, the Bullseye tankard, the Bully figure and Jim Bowen’s glasses. The Bullseye logo is wild and it can appear stacked on the reels while there are also ‘Bonus’ and ‘Free Spins’ symbols. Landing three ‘Free Spins’ symbols triggers 15 free spins during which all payouts are doubled. There is also a Bully’s Prize Board bonus game which is triggered by landing the ‘Bonus’ symbol on reels 1 and 5 and players are given five darts to earn multipliers of between 2x and 15x.